The age-old traditions and craftsmen’s skill embodied in Swiss watches still make the whole world stand in admiration. A healthy conservatism has become an integral part of the image of many famous makes, but there is always somebody who decides to throw down a challenge to the established stereotypes and create something out of the ordinary. This was the strategy that the “Lengnau” company (later renamed the Rado Watch Co. Ltd.) chose to adopt when it produced its first watches under the Rado trademark. It should be said that for 40 years prior to this the company had been engaged exclusively in the manufacture of watch mechanisms, but that did not bring them the world-wide renown that they have achieved on account of their watches. They opted for non-traditional, futuristic designs and unconventional materials. IS IT POSSIBLE to create a watch that is not subject to the destructive influence of time and will retain its original brilliance decades later? Of course it is! At a time when another companies are using gold, brass, silver or steel, Rado watches are made only from high-technology long-lasting materials. The body and strap are made from a special material, produced with the use of wolfram-carbide powder. It is first processed in a particular way under a pressure of around 1000 atmospheres (by way of comparison, there are only 2 atmospheres in car tyres), then heated to a temperature of 1450 °C. The resulting substance is so durable that it can only be polished using diamond dust. The watchmakers at "Lengnau" have a no less serious approach to the glass covering the watch face. In order to make it highly durable, but at the same time keep it transparent, sapphire crystals are grown that exactly reproduce the shape of natural stones. This is a very complicated process, requiring high-temperature treatment (2050 °C). The crystal obtained by this method is similar to native ore; it is then cut into pieces with diamond cutters. The glass produced is of high durability and resistant to scratching and chipping. The Rado specialists make stringent demands on all the materials used. Longevity, beauty and lustre are considered to be of equal importance with durability. In addition, the watches must not cause allergies or irritation, even to people with sensitive skin. In the 1980s they discovered a material that met all these requirements but had never until then been employed in watch-making or jewellery. It is a special ceramic that has been used to make the heat panels for spaceships, as it is resistant to the friction caused when entering the dense layers of the Earth's atmosphere. Not surprisingly, the first collection of watches containing this material was called Ceramica. Despite these achievements, however, the company's constant aim was to create the strongest watches on Earth. This dream was realised in 1997 with the introduction of the Vision 1 model. It was made from 4000 diamonds of a millimetre each — the most durable stone on the planet. At a temperature of 1500 °C and under a pressure of 50,000 atmospheres (as though the weight of a large passenger aircraft was directed on to an area equal to the surface of a coin), the diamonds are literally baked together with the metallic body of the watch. This did not mark the end of the experiments, however: watches with a diamond surface are certainly the most hard-wearing (from 7000 to 10,000 on the Vickers scale), but they are very expensive. That meant that the company had to continue the search for materials that were close to diamonds in terms of durability but would be cheaper. So for example, the experts came across the rare metal lantan, found in Western Australia, Centre Africa and Brazil. After a lengthy process, this metal produces a substance whose hardness reaches 2400- 3200 on the Vickers scale. 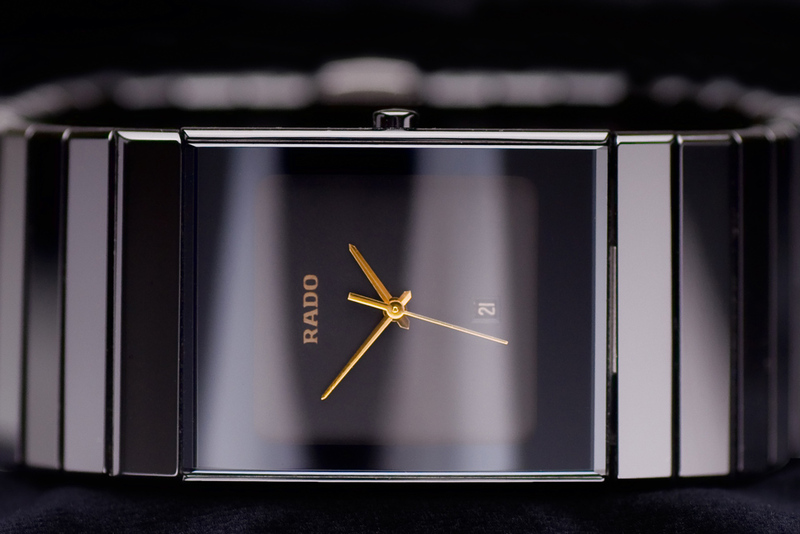 DESIGN is no less important to Rado. It is perhaps the only make hat attempts to break down the established stereotypes of what i watch should look like. Experiments with shape have been going on since the appearance of Rado's first DiaStar collection. An innovative design is the outward expression of inner perfection. Watches should not stand still, they should go forward, in step with time and progress. The shape is determined less by the functional purpose of each model and more by the philosophy invested in it by the designer. This concept gives huge scope for putting into practice a great variety of ideas and notions as regards contemporary shapes. 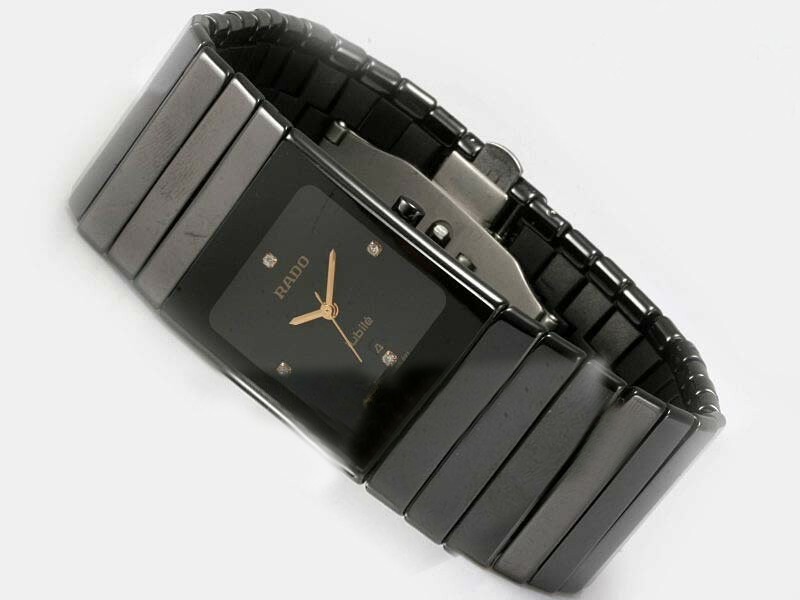 For example, the Ovation model that came out in 2000 is imbued with reminiscences of the first Rado collections. It is retro style, but in a futuristic rather than a classical way. It is as if they are taking us "back to the beginning of the beginning of the future", when the era of high-durability watches had only just started. To get an idea of what a sports watch whose external appearance has passed through the prism of Rado should look like, look at the Cintra Chrono. Its shape, a basic rectangle with slightly rounded sides, is very typical of this manufacturer. Creating entirely new designs is a very complex task, especially ten the company has 40 years of experiments with materials d shapes lie behind it. A great deal of effort and energy goes into developing a watch that can exude a spirit of light-heart - ness, freshness and modernity — for those who are a young at art, as the saying goes. Last year saw the launch of the latest w model, the Xeramo. Incidentally, the name was not arrived accidentally. It consists of parts of three different words: two English ones ("X" from "extreme" and "era" from "ceramics") and one Spanish one ("amo" from "amor", meaning "love"). 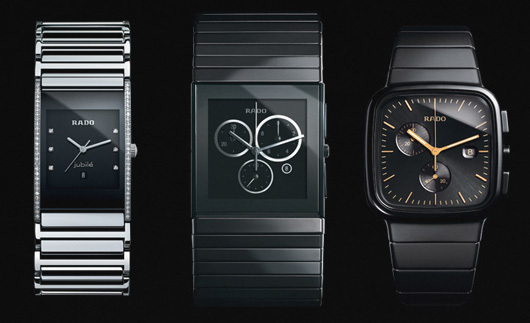 3erhaps the most unusual Rado model to be launched in the t few years, however, is the Cerix. Our concept of watches is »t they are either round or square, but I he basis of the Cerix. 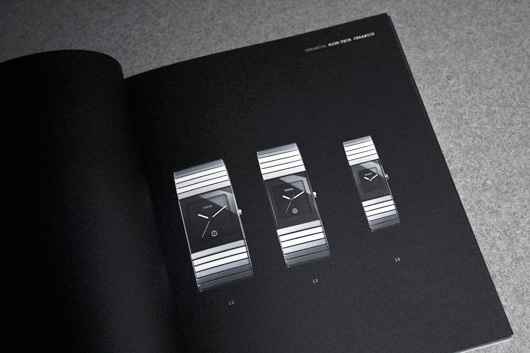 Our concept of watches is that they are either round or square, but the basis of the Cerix collection was a spiral. This unconventional design aroused great public interest, which in turn led to commercial success. In a word, it is sometimes wort departing from rigid frameworks and giving imagination a free rein. Since 1983 Rado, along with such famous companies as Omega, Longines, Brequet, Tissot and others, has been part of the world’s largest watch holding company, the Swatch Group (formerly called SMH). They all began actively marketing their watches in Russia in the mid-1990s. One of those who contributed to the development of relations with the Swiss companies was Gennady Volodchenko, now director of the "Prestige" salon. "When did Rado watches first come to Russia?" "Rado came to Russia along with Omega, Longines and Tissot. At that time not many people knew about Swiss watches; there was certainly an interest in them, as many realised that they are ,i status symbol all over the world, but only the best-known makes had been heard of. We then decided to open a watch salon of European standard, presenting a wide range of models, so that people had a choice and could compare the different makes. We decided to go with the Swatch Group, and I am proud to say that up to now watches made by the group's companies (I'm talking about Omega, Longines, Rado and Tissot) are the biggest-selling Swiss-made models in Russia." 'What are the reasons for this popularity?" "A key role is played by the approach of the Swatch Group to the sale of watches. The corporation's specialists carefully check out every potential partner company. If everything is in order, the salon can open, but all shops have to meet the Swatch Group's standards. This applies to the quality of equipment, advertising and staff — nothing is unimportant. Great emphasis is laid on the selection available — watches only sell when there are a lot of them. Another important factor is a well- organised advertising policy."